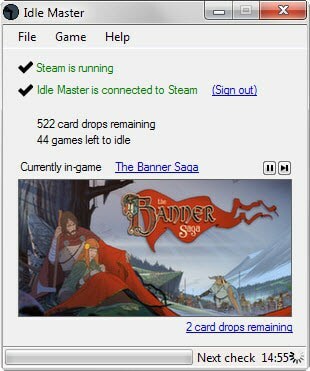 Idle Master is a free program for Microsoft Windows operating systems that gets you trading card drops for games that you own but don't play or have not installed on Steam. Valve introduced trading cards a while ago on Steam. The system rewards players with cards for specific games supporting the system which they can combine to badges to level up their Steam account, trade or sell on the marketplace. Cards can be completely ignored but there is a thriving economy that is built around cards and other digital items. Since many games support trading cards on Steam, you'd have to install and play them all to get all the cards. That's where Idle Master comes into play. The free program runs in the background and ensures that you get card drops for all games supporting the system even if they are not installed on Steam or not played. All you need to do is install Idle Master on your system and run the Steam client afterwards. Idle Master recognizes that Steam is running and requires that you sign in to your Steam account afterwards to link the program to the account. If everything goes well, you should see a green status next to Steam is running and Idle Master is connected to Steam. When that happens, the first game of your game library that has card drops is loaded. The application simulates you being idle in the game to get cards to drop. Once it realizes a game has no more cards to give, it will move on to the next game. You can make a couple of changes in the program settings. For instance, you may change the order in which games are processed from alphabetical to prioritizing games with the highest value cards or the most card drops left. That's the big question. There are two main points of concern that users may have. First, is the application itself trustworthy and not stealing your login information, and second, is it safe to use or are you risking an account ban if you use Idle Master? The application has been released on GitHub which means that its source is available. In addition, its author is also the author of Enhanced Steam, a long standing browser extension for Steam. The answer to the second question however is not as easy to answer. Valve does not seem to care currently about the program. The company could however ban users who use Idle Master in the future. The author believes it to be "pretty safe" but that is not a guarantee that Valve won't act on it. Idle Master is a handy program for users who have many games on Steam that they have not run yet. If you buy games regularly during Sales you may have dozens or even hundreds of games that you have not played yet that support cards. If that is the case, and you are interested in getting those cards but not in installing those games, then you may find Idle Master useful. After all, you can either sell those cards on the market, trade them or use them to craft badges. If you are concerned that Valve may act on it, then it is better if you don't use the program as there is a chance, as slim as it may be, that accounts may get banned by the company in the future. Well, it is not different from installing the game, launching it and idling in it until all cards drop. Well it is stealing if you don’t own a game. for ‘old’ games you have played when the cards were not active yet it could be a plausible solution. if its really just opening !your! games and waiting to drop cards, then it should be legal. Still not happy to have to login with my steam account in another program. This only works for games you have bought, not for games you don’t own. I have 724 steam games, 4 months ago i farmed with this software 64€ worth of steam cards. This is nice because with all those games i don’t play (mostly games from bundles) i can have money for MOAR GAMES. Ok i may have a problem. My friend makes you look like an amateur collector. I’d post a screenshot, but this comment software on ghacks forbids links without approval and often my posts (with links) get overlooked/forgotten. Anyway, he has 1345 games, and another 645 DLC’s. I guess I make him look like an amateur amateur collector collector then, what with 1800 titles and 800+ DLC registered to my account. Not that it really matters – Steam being turned into an e-peen contest to see whose is big enough to crush all others is one of the most asinine things I’ve ever experienced in 20+ years of gaming. I have 5000 games. God help me. I’ve used this program for a long time. It’s definitely better than idling my 500+ games for the cards. It seem that IDLE for Steam is creating very useful software. If it becomes widespread, it will simply reduce the value of all cards. Valve probably won’t care much because the economy will take care of the flood of cards. It’s already widespread (and the method before it existed, where editing a text file found within certain games regarding their Steam app IDs and then running an .exe file, is also in use). Valve doesn’t care and using a program like Idle Master (or its much hushed counterpart, Steam Achievement Manager (which does the same thing with the addition of “cheating” achievements)) is only detrimental to those who forget they’ve left it running and connect to a VAC-enabled game and join a VAC-enabled server while doing so. The only change Valve has put into effect regarding cards has been the 2 hour limit to get the first card drop from any title that has the trading cards feature. And even then, Valve only put that in to combat the fact that people were abusing the refund system and taking advantage of games with cards. I think people tend to place a lot more faith in Valve being some overly active entity than they actually are in reality. In the past 5-8 years, they’ve gradually moved to a large hands-off approach when dealing with Steam, leaving many aspects to the developers/etc. selling titles through it and only intervening when they absolutely have to do so. Martin, you might want to correct the first sentence in the article. It only gets cards for games you own. That’s what I meant. Have added a couple of words to make it clearer. i had a few games installed and after a while the idling finished. Now i added new games in my library and yet the program still says “idling complete”. how can i make it start again? pause/ resume idling doesn’t work either..
Is there a new link or download available? the download link on the website is broken. The download works for me. What’s happening on your end?